Icosahedral quasicrystals (IQCs) have icosahedral symmetry but are not periodic in any direction. This structure was discovered by Dr. Daniel Schechtman in 1984. For this reason, He was awarded the Nobel Prize in 2011. Figure 1454a shows an electron diffraction pattern taken from an icosahedral quasicrystal of rapidly solidified alloys of Al with 10–14% Mn . The diffraction pattern is ten-fold, i.e. turning the figure a tenth of a full circle (36°) results in the same pattern, which has a forbidden symmetry (see page1622). The quasicrystal structure breaks the periodicity (translational symmetry, or the ability to shift the crystal one unit cell without changing the pattern) of a normal crystal. 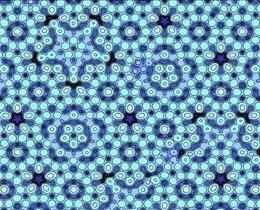 In this case, the quasicrystalline patterns will fill all available space, but in such a way that the pattern of its atomic arrangement never repeats. The perfect pentagons are highlighted in the diagram on the right. A pentagon is clearly inside another pentagon. Figure 1454b shows that Dr. Dan Shechtman displayed a IQC model in his lab in Haifa, Israel. Figure 1454b. Dr. Dan Shechtman displaying a IQC model in his lab in Haifa, Israel (Photograph by David Blumenfeld). Figure 1454c shows an atomic model of a silver-aluminium quasicrystal indicating its mosaic pattern. Many icosahedral quasicrystal structures have been identified in the seven crystal families, including Al-based, Mg-based, Ti-based, etc. Examples of icosahedral phases are Al-Mn, Al-Mn-Si, Al-Li-Cu, Al-Pd-Mn, Al-Cu-Fe, Al-Mg-Zn, Zn-Mg-RE (RE = La,Ce,Nd,Sm,Gd,Dy,Ho,Y), Ti-TM (TM = Fe, Mn, Co, Ni), Nb-Fe, V-Ni-Si, and Pd-U-Si alloys. Icosahedral quasicrystal structures have point group -53m ( ). Table 1454 lists the structure details of the main types of icosahedral quasicrystals. Table 1454. Main types of icosahedral quasicrystals. 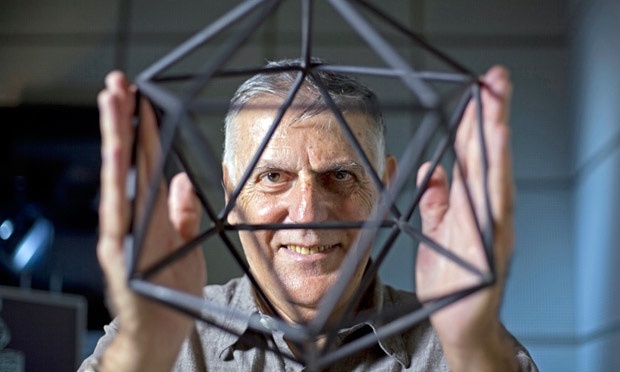 The Nobel Prize in Chemistry 2011 was awarded to Dan Shechtman for the discovery of quasicrystals. Ames Laboratory, Nature, doi:10.1038/news.2011.572, 2011.